A quick note on my travels in the Brecilian Forest. 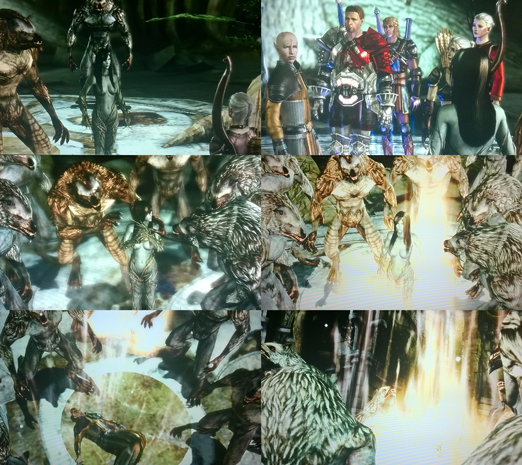 The Grey Warden, Lÿssa, and her companions were sent on a quest by the Dalish Elf Keeper, Zathrian, at their nearby camp. The elves were ambushed by the werewolves of the forest and had be infected by the curse. 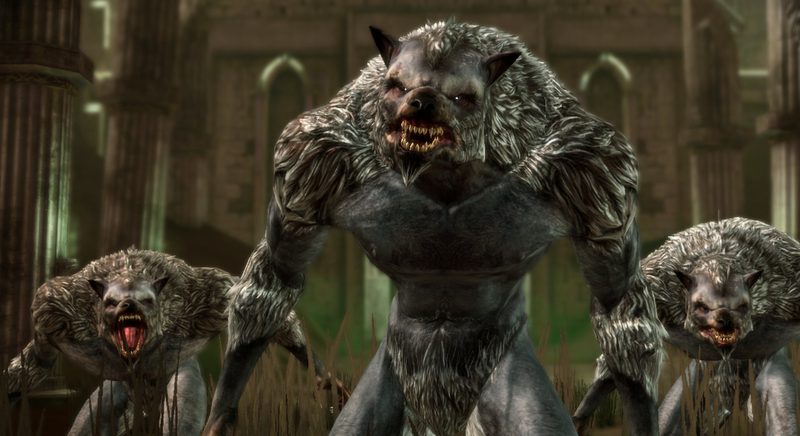 We were sent to find Witherfang, the wolf who started the curse. The werewolves were at first hesitant to fight our heroes, the wolf Swiftrunner tried to convince the heroes to stay out of the fight. When they were told this was not going to happen, the wolves attacked. They were beat of again and again, and many wolves died in the conflict. Eventually, the Brecilian ruins were found, the place we were heading to. Our hero felt a surge of power soon after entering the ruins, and felt more dexterous and strong! At this point I finally decided to chose my specifications. I chose Bard and Ranger, and am now able to summon a wolf! I received to achievements at this point; Veteran and Elite, for choosing Specialisations 1 and 2. And then whilst looting, my inventory was full, so I had to destroy some items. I opted for destroying “steel” items, hoping they would be worth the least. I love looting, but it makes me very slow at playing games. Eventually a point was reached where Swiftrunner appeared for another truce moment, he would then take the companions to meet The Lady of the Forest, who our hero suspected to be Witherfang. Ever the diplomat, Lÿssa tried to hear out all sides before taking action, and so to follow the Wolf. Of course the Lady of the Forest was naked.. Right from the start our heroes were given a demonic impression, or some form of spirit, with black eyes and a wooden edge to her limbs. She offers a greater explanation to our heroes, a time for a history lesson it seems. She tells of the past were two Dalish children were tortured, raped and left for dead. The boy was dead, yet the young girl recovered only to find out she was pregnant. And so she kills herself. Zathrian, from his own hatred and heartache cursed the humans who made his children suffer, by summoning the spirit of the forest, and combining with a wolf. We have Witherfang. Using his own blood, which we are to find out later. The Lady then asks us to bring Zathrian to her, so she can talk to him. She wants to prove the wolves are no longer mindless beast; that they aren’t the culprits of the original crime, just unfortunates who wandered into the forest. On exiting the hall the heroes walk back towards the entrance, where they meet Zathrian. “You are Dalish, you must understand” he says to try and convince Lÿssa, the Dalish Grey Warden, that what he is doing is just. He does not believe any human is innocent. What I really love about this game is that it takes note of your choices and it responds correctly. If I had created my character as a human, this conversation with Zathrian would most likely be very different, which I will find out in my next play through. Zathrian is convinced enough to follow the hero to The Lady of the Forest, yet not convinced enough to ask for the heroes aid against the wolves. “I will assist you if the wolves attack first.” He sighs and proceeds to listen to the plea of the wolves. Here our brave companions find out that Zathrian is linked to the curse, that it is actually keeping him alive. On hearing that Lÿssa will not back up his selfishness, Alistair approves, and tries to convince him that his revenge does not justify the rest of his clan dying. He removes the curse, Witherfang/The Lady of the Forest and Zathrian pass on and the wolves are now humans. They say they will try and find others of their kind, more humans. At this point I was really worried that I would have to fight the Dalish, their keeper was dead yet I was returning? 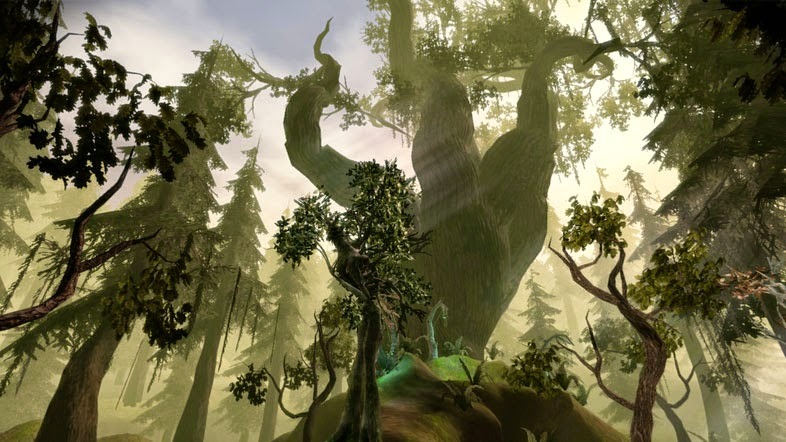 As the heroes return to the camp of the Dalish Zathrians’ Apprentice, Lanaya, who thanks them for their help as well as informing them that the hurt elves are getting better, and she can feel within her that the curse has been lifted. It isn’t all good news however as before heading into the forest, the elf Anthras asked us to try and find his wife. Zathrian had told him she was dead, but he believed her alive. Our heroes found her, but as a wolf. In a tremendous amount of pain Dangla begged to be aided in finding piece, and for her husband to know she loved him. It was a sad situation, but he was thankful to know what happened. Whilst in the forest our hero discovered multiple demonic locations, where the companions were ambushed by demons. After returning to the Dalish camp, Lÿssa returns to the ruins in the forest and completes the Elven ritual and now has a full set of Juggernaut armour. Alistair is my main fighter and in his own special armour I decided to give the Juggernaut armour to Sten. I then made sure all of my companions were levelled up, gave out some gifts, had a talk with them all and readied myself for my next quest. 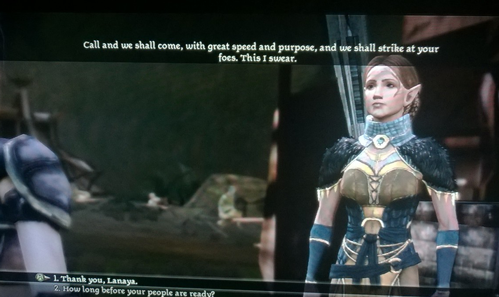 This was a great quest and I really enjoyed the moral choices I had to make. After this quest I received some more achievement points 20, Poacher.